Elizabethtown, Kentucky, December 6, 2016—The Elizabethtown Tourism and Convention Bureau received an award in the Kentucky Travel Industry Association’s (K.T.I.A.) 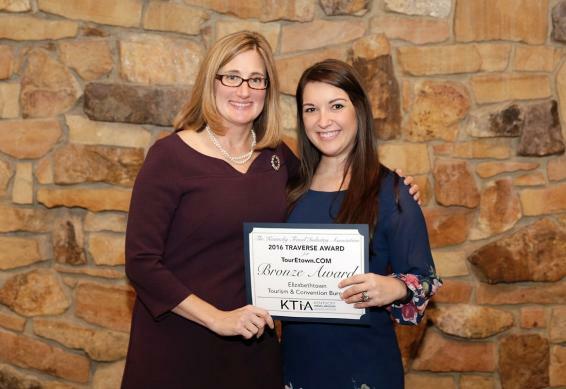 Traverse Awards for Excellence in Tourism Marketing competition on November 2 during K.T.I.A.’s Annual Fall Conference. The Tourism Bureau won a Bronze Traverse Award for their newly remodeled website, TourEtown.com. “We put a lot of work in to making our website aesthetically pleasing and user-friendly, so we’re thrilled to win this award,” said Elizabethtown Tourism communications director, Jessica Gowen. The Traverse Awards is an annual showcase for tourism agencies around the state competing in more than 20 categories of tourism marketing.